What a difference a few days make. I planned on making this post last Thursday after a client meeting where the discussion included the pros and cons of an investment allocation to gold. My basic premise is no truer today than it was before gold's plunge in price Monday, but it would have given me a few bonus points to state my thesis on gold before the dramatic sell off. The case for gold in a portfolio like the case for any precious metal is difficult to make. The theoretical support would be that it is a good inflation hedge, an historical store of value across societies and time, and uncorrelated with most other investments. But that is where the difficulty begins because those beliefs are not as ironclad as goldbugs would have you believe. In fact the most important theoretical support for gold, inflation hedging, seems to be the weakest case of the three. We'll get to that in a second, but first let's consider what gold lacks. Gold lacks industrial use. It is not a capital good. It is a consumer good. So is bread, Travertine tile, and 55"-LED LCD TVs. Unlike bread, it won't go bad, but also unlike bread, it won't do you a bit of good if you eat it. It is durable like Travertine tile, but a lot more expensive--so much so that someone might try to steal it, which makes it expensive just to protect. One ounce of gold will buy you a pretty good TV. At the margin, I'd rather have the TV. Already there is something funny about using this soft, yellow metal as an investment asset. 3. "Gold is a way of going long on fear, and it has been a pretty good way of going long on fear from time to time. But you really have to hope people become more afraid in a year or two years than they are now. And if they become more afraid you make money, if they become less afraid you lose money, but the gold itself doesn't produce anything." The first quote alludes to a chief problem many including myself have with gold as an investment--it has no cash flow. Aside from a potential positive roll yield when the futures market is in backwardation, a gold allocation generates no gains but does have substantial costs to maintain (transactions, storage, and carrying). And realize that not having a cash flow of any kind (direct to the investor like a dividend or interest payment or indirect to the firm like a profit stream) means we can only value it based on the amorphous idea that someone does and will want it at a future date at a price attractive for us to sell. Let's now turn to the historical record. To be a good inflation hedge, an asset should have a high correlation to inflation along with relative outperformance of inflation--when inflation is high, the asset is high or higher and when inflation is low, the asset is low or not as low. The first part is crucial. We want our inflation hedge to come through in the clutch. 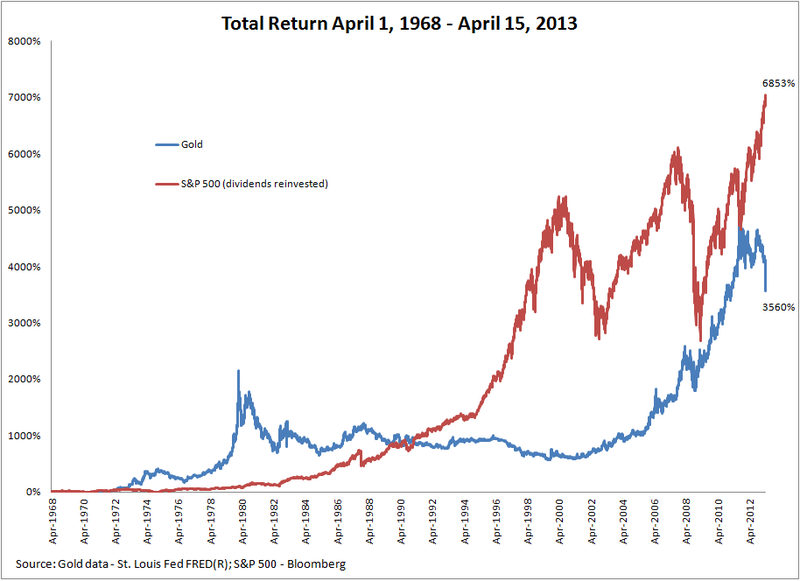 The U.S. left the gold standard in April of 1968 allowing gold to freely float when priced in dollars. It is at this point that it became investable as a theoretical hedge against dollar inflation. This return difference is impressive. 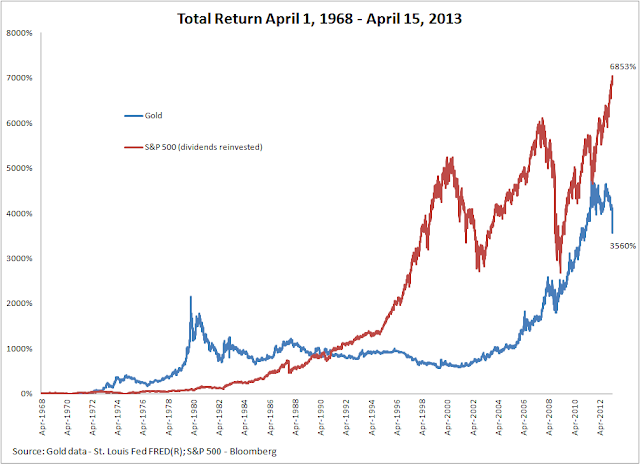 While gold was in the lead for two decades, the S&P 500 made a strong comeback to take over. Only the recent run up in gold has helped the yellow metal gain some but not all ground. And notice the long lulls for gold. This is another knock against it. For someone retiring in 1984, it would not have been a very good store of retirement value. Over the full span the S&P 500 is over 50% higher in value. To understand how big that is think about everything you own and then imagine not having half of it. Gold beckons you to enter, but there is no disguising what I fear.